Federal Reserve Chair Janet Yellen sought to reassure Wall Street Wednesday that the US central bank would not raise interest rates in the near term. Yellen’s press conference followed a two-day meeting of the Fed’s policy-making Federal Open Market Committee (FOMC), which took place against the backdrop of plunging oil prices, a collapse of the Russian ruble, and currency turmoil in many emerging economies. “The committee considers it unlikely to begin the normalization process for at least the next couple of meetings,” Yellen said, indicating that the Fed is not likely to take any action on interest rates until late April at the earliest. US stocks rose sharply on the news, with the Dow Jones Industrial Average closing up by 288 points, or 1.69 percent, to 17,356. The US dollar rose by nearly 2 percent over the Japanese yen in the day’s trading. The euphoric response on financial markets reflected the nervousness with which Wall Street is eyeing the global economy, as well as the immense dependence of the world financial system on a continuous flow of cheap money from the Federal Reserve and other central banks. The Fed statement also noted that “inflation has continued to run below the Committee’s longer-run objective,” adding that the low inflation levels reflect “declines in energy prices.” Oil prices have fallen by more than 20 percent over the past month, adding to deflationary pressures throughout the world economy. The US Labor Department said Wednesday morning that consumer prices posted their sharpest decline in six years. The Consumer Price Index fell by 0.3 percent in November, the largest decline since late 2008. Over the past 12 months, consumer prices have grown by only 1.3 percent, significantly lower than the Federal Reserve’s target of 2 percent. The projections by individual members of the FOMC showed a slower pace of interest rate increases than previously indicated. The median projected federal funds rate was 1.125 percent in late 2015, down from 1.375 percent in the previous estimate in September. Such a projection would imply four quarter-point rate increases next year, rather than the five that would have been indicated by September’s projections. FOMC members also lowered their interest rate projections for 2016 from 3 percent to 2.75 percent. Committee members said they expected the economy to grow at a rate of 2.6 percent to 3.0 percent in 2015, unchanged from the previous projection. They also said they expected the unemployment rate to fall from the current rate of 5.8 percent to between 5.2 and 5.3 percent by the end of next year. They lowered their projections for inflation to between 1.0 and 1.6 percent. 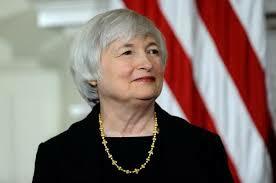 There were three dissenting votes on the FOMC statement, an unusually large number. Richard Fisher of the Federal Reserve Bank of Dallas and Charles Plosser of the Federal Reserve Bank of Philadelphia said they thought the Federal Reserve should move more quickly to raise rates, while Narayana Kocherlakota of the Federal Reserve Bank of Minneapolis said the Fed should do more to combat falling prices. The Federal Reserve has kept the Federal Funds Rate at near zero for over six years and expanded the size of its balance sheet by some $3.5 trillion through a series of asset purchases known as Quantitative Easing. As a result of these policies, the value of financial assets, monopolized by the wealthy, has more than doubled. But with millions of people still unemployed and millions more working part-time or having dropped out of the labor force, the real economy remains depressed.